Analysis of the uronephrological morbidity and mortality in the Russian Federation during the 10-year period (2002-2012) according to the official statistics Apolihin O.I., Sivkov A.V., Moskaleva N.G., Solnceva T.V., Komarova V.A. Reparative regeneration of the testicles in various types of damage to the blood-testis barrier Hramcova Yu.S., Artashyan O.S., Pugachev N.N. Androgens and chronic ischemia – two independent factors of benign prostate hyperplasia development Kirpatovskiy V.I., Mudraya I.S., Mkrtchyan K.G., Adamyan N.K., Efremov G.D., Ivanov A.P., Kabanova I.V., Nadtochiy O.N. Morphological estimation of prostate protective activity of suppositories with maclura pomifera oil extract Zaychenko A.V., Tackiy Yu.A., Korotkov V.A., Kovalenko E.N., Andriyanenkov A.V., Kuhtenko A.S. Choosing a method of bladder drainage during HIFU-therapy of prostate cancer Shestaev A.Yu., Protoschak V.V., Sinel'nikov L.M., Kardinalova V.A., Eloev R.A.
Russian PCA3 test-system: first results Sidorenkov A.V., Govorov A.V., Pushkar' D.Yu., Pavlov K. A., Shkoporov A.N., Hohlova E.V., Korchagina A.A., Grigor'ev M.E., Chehonin V.P. Robot-assisted laparoscopic diverticulectomy: our first experience Vasil'ev A.O., Govorov A.V., D'yakov V.V., Kovylina M.V., Prilepskaya E.A., Kolontarev K.B., Pushkar' D.Yu., Davydova E.S. Our experience with bipolar vaporesection of the prostate in treatment of benign prostatic hyperplasia Semenychev D.V., Sevryukov F.A., Sorokin D.A., Karpuhin I.V., Puchkin A.B., Kochkin A.D.
Our 5-year experience of performing percutaneous nephrolithotomy on patients with large and staghorn kidney stones Merinov D.S., Pavlov D.A., Gurbanov Sh. Sh., Fatihov R.R., Epishov V.A., Artemov A.V., Shvangiradze I.A. Surgical treatment of patients with large and staghorn stones of the solitary kidney: experience of the Scientific Institute of Urology Katibov M.I., Merinov D.S., Gadzhiev G.D., Hnykin F.N., Shvangiradze I.A. Clinical results of treatment bilateral staghorn nephrolithiasis Chernyshev I.V., Katibov M.I., Shvangiradze I.A., Gadzhiev G.D., Anohin N.V. Male infertility and insulin resistance: are there any pathogenic links, and who, when and how must diagnose and treat them? Tyuzikov I.A., Kalinchenko S.Yu., Vorslov V.O., Tishova Yu.A. 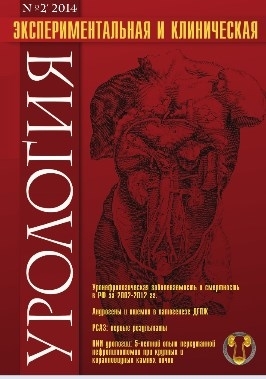 Infuence of prostatitis and varicocele on reproductive function of young men Osadchuk L.V., Popova A.V., Voroshilova N.A. Stress incontinence after surgery for pelvic organ prolapse Tupikina N.V., Kasyan G.R., Gvozdev M.Yu., Barinova M.N., Pushkar' D.Yu. Medical therapy of metabolic damage to the bones caused by nephrolithiasis Yarovoy S.K., Moskaleva N.G., Maksudov R.R. Uremic toxins in blood of end stage renal disease patients with dysbiosis of digestive tract Sivkov A.V., Sinyuhin V.N., Arzumanov S.V., Stecyuk E.A., Korobova T.A. Complications of the preputioplasty in children with distal hypospadias repair Kagancov I.M. Enuresis—theoretic background and practical guidelines Garmanova T.N., Shaderkina V.A.